Housing is in the news - conditions, safety, shortages, rip-off rents, and rogue landlords. In Portsmouth, a city with a housing shortage, local tradespeople are talking openly about ‘600 student houses’ in the city lying empty this academic year. It’s certainly true that in my area many are unseasonably untenanted and hushed. It’s probably a relief for some beleaguered neighbours, and ought to be a welcome source of additional Council Tax revenue for the the Local Authority given that the landlords are liable to pay up to a city facing severe austerity cuts. Significantly, the terraced houses once let to students aren’t empty because of the huge ongoing building programme of privately built student ‘Halls’. This is not a policy victory. It’s a market failing. These ‘Halls’ supposedly have vacancies too, not least because of the eye-watering costs of renting them for students already dependent on scarily huge loans. Tuition fees are £9,250 a year. The maximum maintenance loan for living and study expenses is £8,700 for the poorest students - and private developers are pricing their ‘Halls’ to take as much of that maintenance loan as possible away from students. The developers have done the maths. Hutches in the sky for students can cost upwards of £650 per calendar month per student, featuring claustrophobic rooms with narrow shower ‘pods’, frequently offered with take-it-or-leave-it 45 or 50 week tenancies; whereas a house-share in a residential area can be half of that per student, sometimes for a shorter tenancies. In private ‘Halls’ large deposits and guarantors are required - the guarantor normally being a parent who owns their own home - financial supports which are not always available to students from disadvantaged and more modest backgrounds. Of course students are going to be attracted to the private rented sector in residential areas, especially 3- and 4-bedroom terraced houses, once they’ve got their bearings in a city, if living in a shared house is a lot cheaper, and there’s more space. For the expensive ‘Halls’ rooms (and the even more expensive ‘studios’ that some private developers are building) to be de facto the ‘guaranteed accommodation’ dangled in front of students on A levels results day (whereby universities hard-sell insurance offers, clearing offers and adjustment offers, by guaranteeing accommodation) is pretty duplicitous of higher education institutions. Some universities known to me - with very good academic reputations - are effectively doing business deals with private developers to put paying bums on the expensive seats of their lecture theatres. Other universities know they should be offering more affordable University Halls of their own, but haven’t invested in the land acquisition and the building programmes - and therein lies a tale. Of course universities want the private sector take all the risk - especially with the contraction of student numbers. The demographics of a smaller pool of 18 year olds, the rising costs to students of their loans, the decreasing tax advantages of buy-to-let, the psychology of Brexit fears, and the stalling of an over-expansion of the mid-tariff universities, have all combined to create a very worrying (and predictable) story around property and landlords in cities like Portsmouth, a story which ties into the affordable housing crisis for families and young people in a pretty depressing way. In Portsmouth, or Southampton, or Leeds (where a proper study has at least been attempted by the Local Authority, even if it’s now somewhat out of date), there are obvious tensions between (a) the money to be made by private landlords and businesses renting out students accommodation, (b) the residents who live next the students and the residents on housing waiting lists, and (c) the students’ rights to decent housing for which they’re paying some pretty serious money. The difference between a three bedroom house rented out to a family at the Local Housing Allowance rate of £745 a calendar month for 12 months a year, and the same house rented out to students at £1400 at 10-12 months of the year, can be as high as £4,400 and £7,200 a year. That’s the difference. There’s a lot of profit for landlords in ignoring the family market. How did we come to this, that families with children can often no longer genuinely compete for decent, affordable housing in local housing markets? Especially when landlords are specifying ‘STUDENTS ONLY’ in their property adverts and only offering 9 - 10 month rentals, while still turning a significant profit? Well, maybe the tide is turning - but it won’t help the housing crisis while houses sit empty within a policy vacuum. Another issue is that many landlords of student properties in Portsmouth have been playing the Council Tax dance, relying on students’ legal exemptions to take their properties out of Council Tax altogether. I’d be interesting to know how many landlords actually pay the due Council Tax to the relevant Local Authority when their properties are vacant in the summer (or longer), or play fair with the Council when one of their student tenants drops out of university thus nullifying the property’s exemption. Indeed, whose responsibility is all this? And who holds what data? 1 How many HMO [House in Multiple Occupation] properties hold a council-issued HMO licence in Portsmouth? 2 How many complaints have been recorded about HMOs year on year, since 2010? 3 How many of these complaints led to a removal of the HMO licence? In response to Q1 - the current number of licenced HMOs that the department maintains today is 2912 licences. In response to Q2 & 3 - unfortunately we do not hold this data due to a software data system change and migration. Students, who tend to rent for a year and move on, can be perceived by landlords as ‘easy’ tenants in that they often have parents as guarantors, and may well be persuaded to sign up to joint and several liabilities; and they tend to complain less and accept lower standards, because it’s not their permanent home – and also because there has until very recently been a fair bit of competition in finding affordable student houses. And there’s no rent cap. The only people with any responsibility for monitoring the conditions in student houses, and the effects that poor landlords have on the local communities, are Councils (Local Authorities). 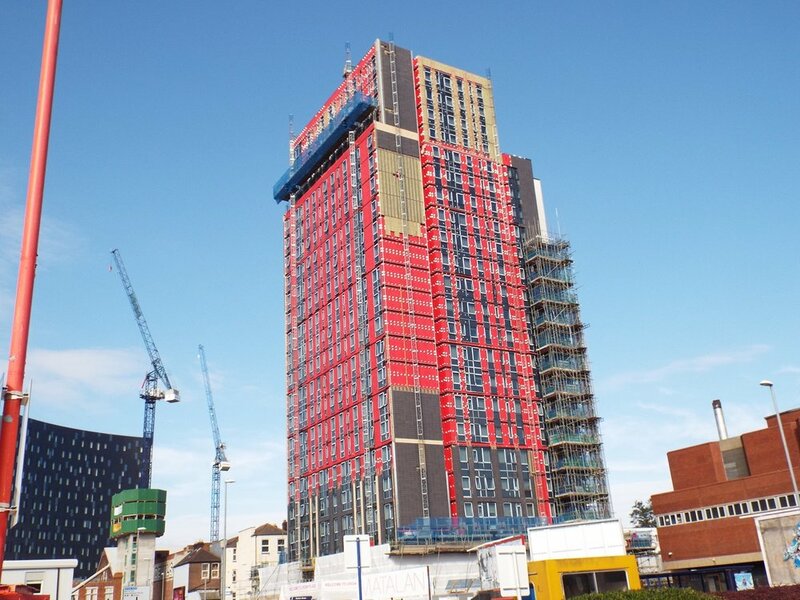 So how well is Portsmouth doing, given current financial and demographic realities, as the city also faces the decanting of hundreds of residents from large tower blocks for critical safety reasons? The Portsmouth City Council department responsible on the face of it for student houses is Private Sector Housing. The department seems to have no available step-by-step complaints procedure or processes to assist residents detrimentally affected. It also doesn’t seem to be holding absent landlords to particularly high standards. For example, a resident complained recently about this property. 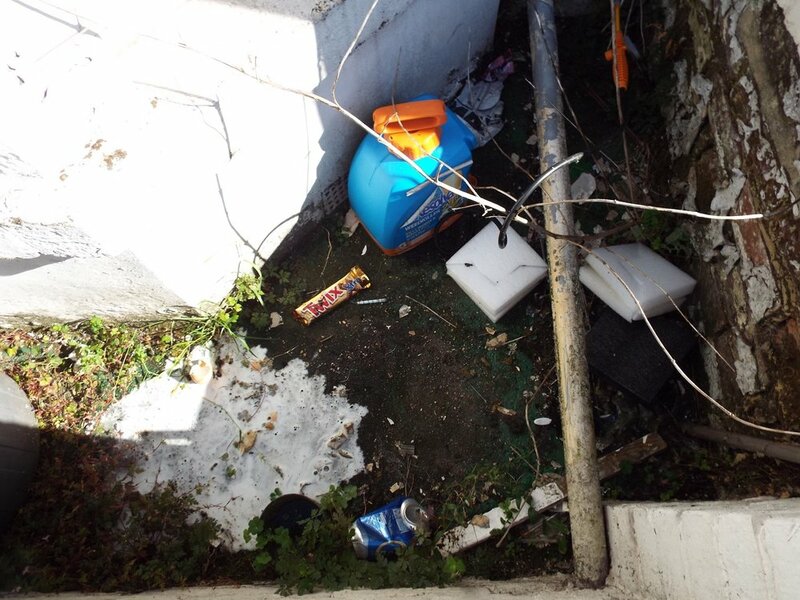 They were told that it had been inspected by Private Sector Housing and that this forecourt was deemed ‘clean and tidy’. Call me fussy, but I think this is a shockingly low threshold for houses in residential areas. Whatever happened to local government’s love of ‘broken window theory’? On the other hand, Portsmouth’s noise team in Environmental Health is to be praised for its effective, rapid service. Noise is one of the biggest nuisance factors for residents living next to (some) students, and one policy suggestion I would make is that a certain number of complaints against a terraced property should trigger a requirement that the landlord soundproofs it at their expense. Soundproofing is most effective when carried inside the property from which the noise originates; and the long-suffering residents shouldn’t have to be footing these bills. That’s a job for the profit-makers. This will in turn help to protect students from repeated complaints that can ultimately lead to disciplinary proceedings being initiated against them by the university. Something is happening in the student rental market in cities like Portsmouth, and the signs are that it’s going to be messy. If these fluctuations happen in a policy vacuum, there will be some quite serious repercussions not only for the health and vibrancy of the built environment, but for the housing crisis as a whole. Buildings and rooms lying empty whilst housing waiting lists grow is not a good look for Portsmouth - or any British city. Landlords may well choose to hang onto property rather than divest themselves of it while the pound tanks. Meanwhile some will still profit from students’ money, and the syphoning off of Housing Benefit into pockets of private investors will still haunt the rest of the private sector, as the Guardian exposed just yesterday. It’s a very damaged built and social environment that sees people’s homes as nothing more than cash cows for private marketeers. POSTSCRIPT 27th October 2018: The Guardian reported today, tucked away in its back pages, on a welcome and successful private members’ bill, which was tabled yesterday by Karen Buck MP in response to the investigative reporting Guardian and ITN on the private rented sector. The bill, which has moved quickly to the Lords, addresses the ‘postcode lottery’ involved with getting Councils and their private sector housing departments to hold landlords to account. ‘The bill will allow tenants to bypass council enforcement teams, some of which have poor records of taking action against rogue landlords. It will also give council tenants an avenue for redress, as local authorities cannot bring cases against themselves.’ Watch this space, when this bill becomes law early next year.